It’s been almost 19 years since I founded Universe Today, back in March, 1999. Back when I started, it was a primarily an email-based newsletter with an archive version on the web where people could read it if they wanted to. The technology was pretty rudimentary at the time, so I had to do everything by hand, sending out a BCC email to thousands of people every day, eventually finding other email mailing list providers. At some point, I shifted from commentary and summaries to full on reporting on space news. And at that time, automated tools arrived that would take all the stories you wrote in a day, bundled them up and sent them out via email to a list of subscribers. That was great and convenient for me, but it didn’t make for the best experience. It lost its soul. A couple of months ago, I decided to return to my roots and continue maintaining a weekly email newsletter that summarizes some of the top stories that happened this week. And not just stories from here on Universe Today, but stories from across the Universe of space journalists and websites, including Space.com, Ars Technica, Ethan Siegel, Brian Koberlein, TheVerge and many more. I see more amazing things out there than we could ever report on. I figured I might as well share it. Each edition of the weekly newsletter comes out on Friday, and is hand-written personally by me, and includes a few dozen summaries and links to stories on Universe Today and beyond, as well as cool pictures, videos, and astrophotography. It’s SPAM free, I won’t sell the email addresses to anyone. There aren’t any ads in them, although I’ll occasionally promote books, trips and other projects I’m working on, but tastefully, I promise. And you can unsubscribe any time you like. If that sounds good to you, go here and sign up. It’s time to do a little shameless self promotion for our tireless staff writer Matt Williams. In addition to pumping out an astonishing amount of space news here on Universe Today, Matt is also a science fiction author, having written 10! books. But in the last week, he’s reached a bit of a special milestone: he’s a published science fiction author, thanks to Castrum Press. Matt’s new book is called The Cronian Incident, and it’s part 1 of a new series called the Formist Series. A disgraced investigator who once worked the Martian beat, Jeremiah Ward now serves his sentence in a mining colony on Mercury. His golden opportunity arises when a member of a powerful faction on Titan vanishes and Ward is promised, in exchange for investigating this man’s disappearance, a clean slate and a second chance. Unwittingly, Ward becomes embroiled in a conspiracy centuries in the making and begins to realise his one shot at redemption may cost him his life. From terraforming to colonisation, to the Technological Singularity and the future of space exploration; The Cronian Incident is a must read for fans of mystery science fiction. I haven’t read it yet, but it’s on my list. But I just wanted to give a huge congratulations to Matt. Setting aside the time to write an entire novel is an enormous achievement. To do it while you’re already working a full time job where you write all day? That’s hurculean. And I know that much of Matt’s work here on Universe Today informed the science he’s using in his stories, especially some of the ideas about terraforming, exotic forms of propulsion, and the future of humanity in space. Matt hard at work at the office. Outer space touches us in so many ways. Meteors from ancient asteroid collisions and dust spalled from comets slam into our atmosphere every day, most of it unseen. Cosmic rays ionize the atoms in our upper air, while the solar wind finds crafty ways to invade the planetary magnetosphere and set the sky afire with aurora. We can’t even walk outside on a sunny summer day without concern for the Sun’s ultraviolet light burning out skin. So perhaps you wouldn’t be surprised that over the course of Earth’s history, our planet has also been affected by one of the most cataclysmic events the universe has to offer: the explosion of a supergiant star in a Type II supernova event. After the collapse of the star’s core, the outgoing shock wave blows the star to pieces, both releasing and creating a host of elements. One of those is iron-60. While most of the iron in the universe is iron-56, a stable atom made up of 26 protons and 30 neutrons, iron-60 has four additional neutrons that make it an unstable radioactive isotope. If a supernova occurs sufficiently close to our Solar System, it’s possible for some of the ejecta to make its way all the way to Earth. 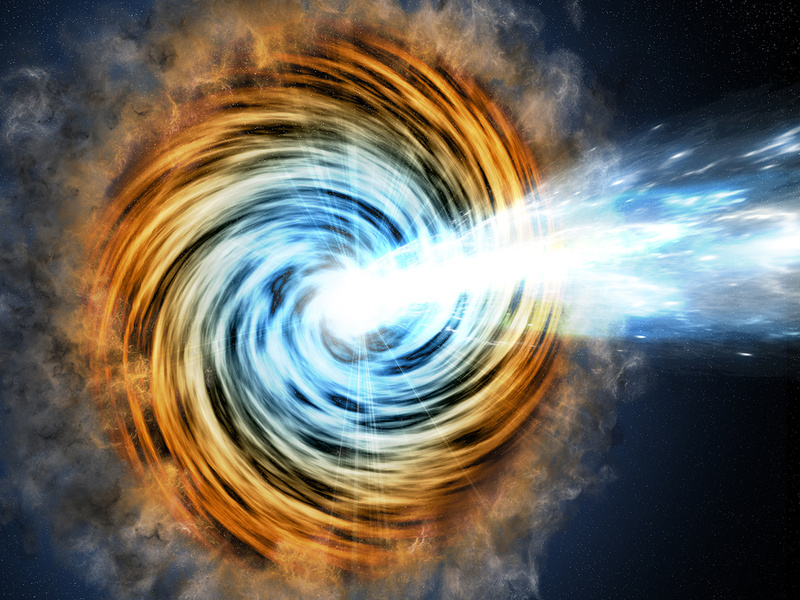 How might we detect these stellar shards? One way would be to look for traces of unique isotopes that could only have been produced by the explosion. A team of German scientists did just that. In a paper published earlier this month in the Proceedings of the National Academy of Sciences, they report the detection of iron-60 in biologically produced nanocrystals of magnetite in two sediment cores drilled from the Pacific Ocean. Magnetite is an iron-rich mineral naturally attracted to a magnet just as a compass needle responds to Earth’s magnetic field. Magnetotactic bacteria, a group of bacteria that orient themselves along Earth’s magnetic field lines, contain specialized structures called magnetosomes, where they store tiny magnetic crystals – primarily as magnetite (or greigite, an iron sulfide) in long chains. It’s thought nature went to all this trouble to help the creatures find water with the optimal oxygen concentration for their survival and reproduction. Even after they’re dead, the bacteria continue to align like microscopic compass needles as they settle to the bottom of the ocean. After the bacteria die, they decay and dissolve away, but the crystals are sturdy enough to be preserved as chains of magnetofossils that resemble beaded garlands on the family Christmas tree. Using a mass spectrometer, which teases one molecule from another with killer accuracy, the team detected “live” iron-60 atoms in the fossilized chains of magnetite crystals produced by the bacteria. Live meaning still fresh. Since the half-life of iron-60 is only 2.6 million years, any primordial iron-60 that seeded the Earth in its formation has long since disappeared. If you go digging around now and find iron-60, you’re likely looking at at a supernova as the smoking gun. Co-authors Peter Ludwig and Shawn Bishop, along with the team, found that the supernova material arrived at Earth about 2.7 million years ago near the boundary of the Pleistocene and Pliocene epochs and rained down for all of 800,000 years before coming to an end around 1.7 million years ago. If ever a hard rain fell. The peak concentration occurred about 2.2 million years ago, the same time our early human ancestors, Homo habilis, were chipping tools from stone. Did they witness the appearance of a spectacularly bright “new star” in the night sky? Assuming the supernova wasn’t obscured by cosmic dust, the sight must have brought our bipedal relations to their knees. There’s even a possibility that an increase in cosmic rays from the event affected our atmosphere and climate and possibly led to a minor die-off at the time. Africa’s climate dried out and repeated cycles of glaciation became common as global temperatures continued their cooling trend from the Pliocene into the Pleistocene. Cosmic rays, which are extremely fast-moving, high-energy protons and atomic nucleic, rip up molecules in the atmosphere and can even penetrate down to the surface during a nearby supernova explosion, within about 50 light years of the Sun. The high dose of radiation would put life at risk, while at the same time providing a surge in the number of mutations, one of the creative forces driving the diversity of life over the history of our planet. Life — always a story of taking the good with the bad. The discovery of iron-60 further cements our connection to the universe at large. Indeed, bacteria munching on supernova ash adds a literal twist to the late Carl Sagan’s famous words: “The cosmos is within us. We are made of star-stuff.” Big or small, we owe our lives to the synthesis of elements within the bellies of stars. The Postal Service will showcase some of the more compelling historic, full-disk images of the planets obtained during the last half-century of space exploration. Some show the planets’ “true color” like Earth and Mars — what one might see if traveling through space. Others, such as Venus, use colors to represent and visualize certain features of a planet based in imaging data. Still others (red storms on Uranus) use the near-infrared spectrum to show things invisible to the human eye. Whenever I go to the post office to pick up stamps I always ask for the most colorful ones. No dead president heads for me. Mailing letters is a rare thing nowadays — might as well choose something colorful and interesting. How sweet then that we’ll soon be able to pick and stick our favorite planets (and dwarf planet!) on the mail and send them flying off to far places. The U.S. Postal Service sneak-previewed a new series of stamps earlier this year highlighting NASA’s Planetary Science program, including a do-over of a famous Pluto stamp commemorating the New Horizons’ historic 2015 flyby. 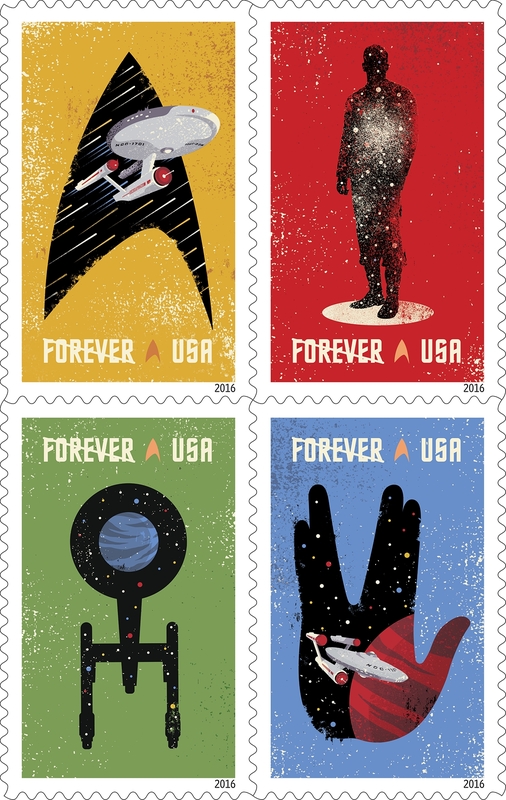 Also in the works are eight new colorful Forever stamps featuring NASA images of the planets, a Global Forever stamp dedicated to Earth’s moon and a tribute to 50 years of Star Trek. The New Horizons team, which placed a 29-cent 1991 “Pluto: Not Yet Explored” stamp on board the New Horizons spacecraft, is thrilled at the updated stamp recognizing the mission. Pluto Explored! In 2006, NASA placed a 29-cent 1991 ‘Pluto: Not Yet Explored’ stamp in the New Horizons spacecraft. With the new stamp, the Postal Service recognizes the first reconnaissance of Pluto in 2015 by NASA’s New Horizon mission. 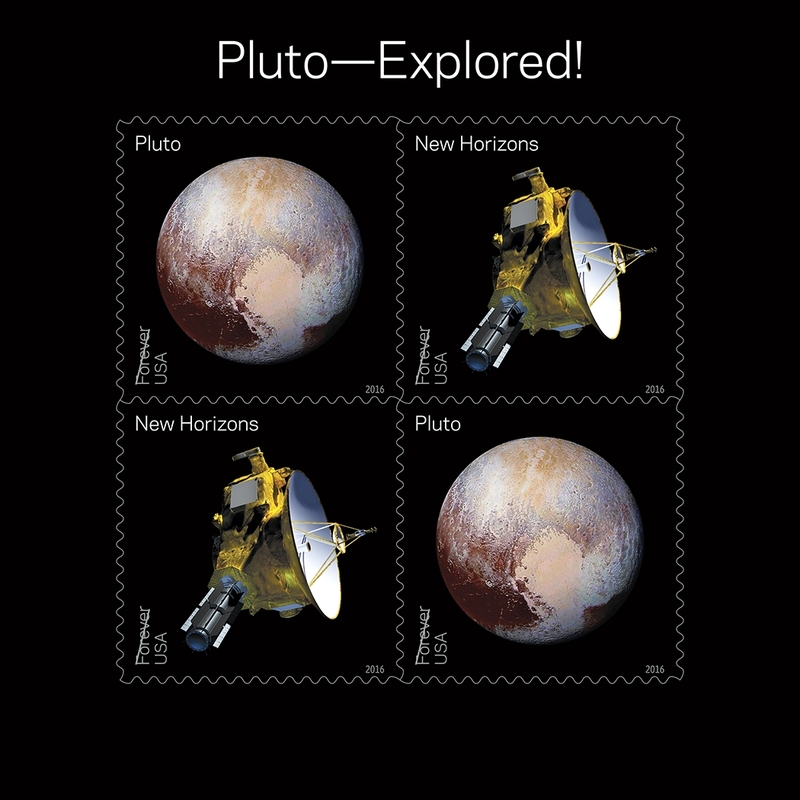 The two separate stamps show an artists’ rendering of the New Horizons spacecraft and the spacecraft’s enhanced color image of Pluto taken near closest approach. In the upcoming planet series, we’re treated to a color-enhanced Mercury taken by MESSENGER highlighting the planet’s varied terrains. Venus appears in all its naked volcanic glory courtesy of the Magellan probe which mapped the planet using cloud-penetrating radar. Like Mercury, it’s also color-enhanced since it’s impossible to see the surface in visual light even from orbit. Earth and Mars were photographed in natural light with orbiting satellites in tow. Ten of the round Global Forever stamps of the Full Moon. Issued at the price of $1.20, this Global Forever stamp can be used to mail a one-ounce letter to any country to which First-Class Mail International service is available. The Hubble Space Telescope photographed Jupiter in infrared light in 2004, capturing a rare triple transit of the moons Ganymede, Io and Callisto. Saturn comes to us from the Cassini probe, still in good health and routinely sending gorgeous images every month of the ringed planet and its moons. Pity the rings had to be trimmed, but it had to be done to keep all the globes close to the same relative size. Hubble took Uranus’ picture in infrared light, while the Neptune close-up was sent by the Voyager 2 spacecraft in 1989. 2016 also marks the 50th anniversary of the television premier of Star Trek, which the post office will commemorate with the new Star Trek Forever stamps. They feature four digital illustrations inspired by the television program: the Starship Enterprise inside the outline of a Starfleet insignia, the silhouette of a crewman in a transporter, the silhouette of the Enterprise from above and the Enterprise inside the outline of the Vulcan salute. 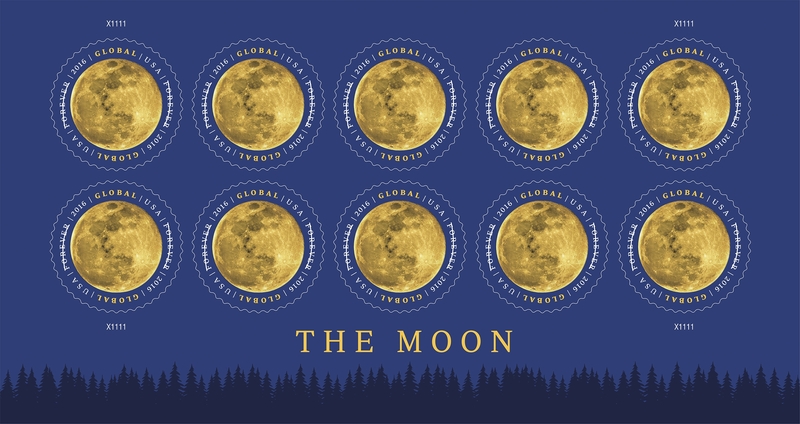 The Global Moon stamp was issued on Feb. 22. 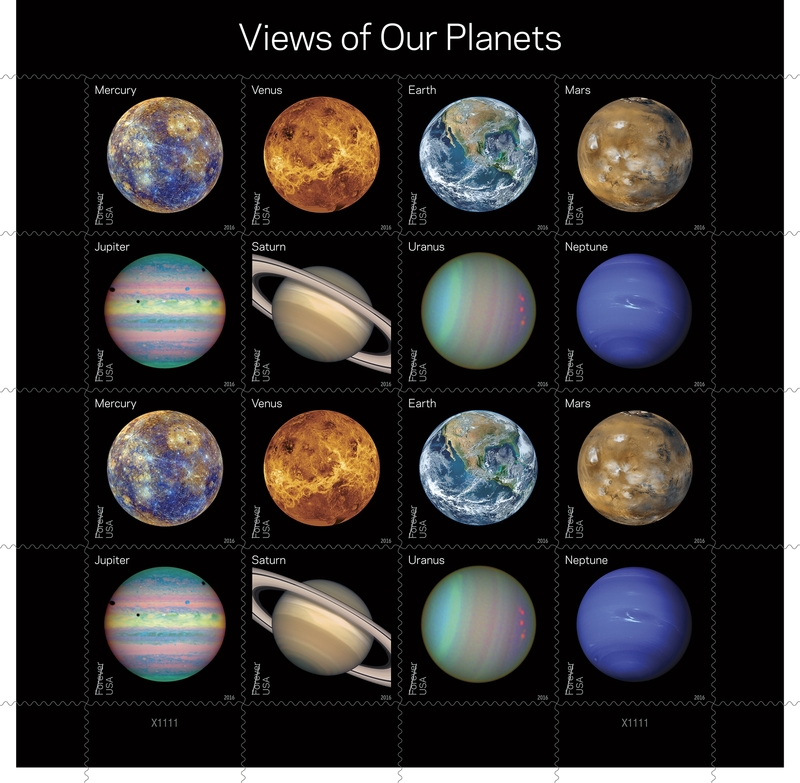 You can pre-order the Pluto and planet stamps from USPS.com 30 days before their dedication between May 28 and June 4 at the World Stamp Show in New York. Expect the Star Trek series sometime this summer.